“This is what happened…” Suddenly, we’re transported into a warm, cramped kitchen. We wrap our hands around a mug of coffee, move our faces over the rim and breath in the steam. Close your eyes for a moment. Then lean forward with eager anticipation. That is the kind of intimacy Ludmilla Petrushevskaya conjures with just four words. “This is what happened.” Her newest short story collection There Once Was A Girl Who Seduced Her Sister’s Husband, And He Hanged Himself: Love Stories is about what happened to who, where so-and-so ended up, and you will not believe what I heard. In a way, these are the stories that we tell each other everyday. Only Petrushevskaya’s narrator is telling them to us from the Soviet Moscow. In reality, life doesn’t stop with a wedding, with a heroic action, or with happy coincidence, as in films, when a certain person misses his boat (Titanic) or, as in this case, when an unmarried woman of thirty-five decades decides to keep the child born of a random tryst with a boy of twenty. That is where Ludmilla Petrushevskaya was born in 1938. Events from her life could easily be confused with the plots of her stories. Cramped, communal apartments; abandonment; hunger; death; poverty; and the constant, daily struggle to survive with soul intact – these are the dioramas she constructs for us out of her own experiences. Polina’s life reached its final, happy phase when her aunt died and left Polina an inheritance. And (as the title tells us) there’s also love, though mostly of the maternal variety. Despite (or perhaps because of) Petrushevskaya’s familiarity with the hardships of the men and women – mostly women – who she writes about, the stories aren’t depressing. Just the opposite. Like all “good” gossip, they contain both irony and the desire to entertain. The storytellers are devoid of malice, speaking with the sing-song cadence of a nursery rhyme. And while not all her characters find happiness, I believe they do achieve their fair portion of fulfillment. At an age when most girls are sensitive to beauty and look for it everywhere, Clarissa was a primitive, absent-minded creature who stared openmouthed at trivial things, like the teacher wiping off the blackboard, and God knows what thoughts ran through her head. 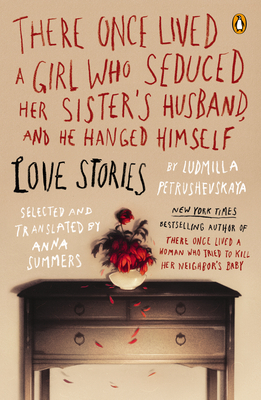 There Once Was A Girl Who Seduced Her Sister’s Husband, And He Hanged Himself opens with Loving Petrushevskay, an introduction written by the translator Anna Summers. All stories need to stand on their own merit but having context can rewarding, particularly with this author. Because many of these stories contain the seed of autobiography. For a time Petrushevskay and her mother lived under a desk belonging to a madman (who happened to also be her grandfather). Though it’s not central to that story, one of her characters does the same. That can’t be an isolated occurence. A mother brought her girl to a sanatorium for sickly children and then left. I was that girl. Ludmilla’s 2009 collection of short stories: There Once Lived A Woman Who Tried To Kill Her Neighbor’s Baby (which I have not read) was subtitled “a collection of scary fairytales”. It made the New York Times bestseller list. I wouldn’t be surprised if this book did the same. Everything about this second collection is designed to engage and entertain… to draw the reader in and keep him. I hope to have a review posted for Sergio Chejfec’s The Planets within the next day or so. In the meantime, here’s a round-up of the items that caught my eye last week. Levi Asher discusses Why Reading Is Always Social over on LitKicks. The NYRB Blog has this post by Tim Parks entitled Most Favored Nations, and this older post The Dull New Global Novel about the homogenization of International Literature. This post at The Three Percent that (in a way) answers my question about the READ RUSSIA! anthology put out by Overlook Press at BEA. The Russia Library Initiative: For Better or Worse . I first learned that Overlook has made an arrangement to publish 125 Russian translations over the next decade from the Three Percent’s Weekly Podcast… but the blog goes into more depth. I also learned about The Walk by Robert Walser on another podcast – Episode 3 of That Other Word from The Center for the Art of Translation. It’s a beautiful New Directions Pearl Edition (all of which I love & covet). 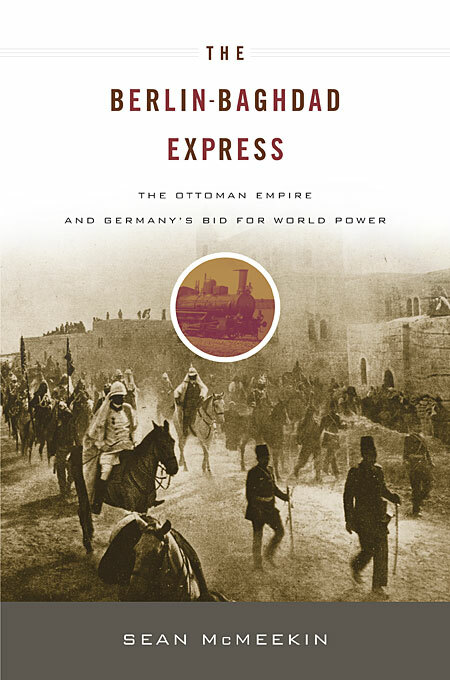 The title Daniel Stein, Interpreter is loaded with meaning. The novel’s namesake and hero is a Polish Jew gifted with languages. He survived WWII by acting as an interpreter for the Germans, the Belorussians and Soviets. Each time the city of Emsk changed hands, so did Daniel. At times re-translating the same documents over again for each new occupier. It was through his position that he was able to save the lives of hundreds of men, women & children – both Jews and non-Jews. After the war Daniel converted to Catholicism and immigrated to Israel as a monk in the Order of Barefoot Carmelites. There he built a sometimes controversial congregation that embraced both the Christian & Jewish faiths. He took on a new role as interpreter – elucidating church doctrine and dogma. He taught that Christianity is an extension of Judaism. He lobbied and eventually sued to gain Israeli citizenship as a Christian Jew. His teachings, while not entirely unique (we’re told there were rabbis who felt the same), were revolutionary. People wrote denunciations against him. I had one sad little paper here for a long time which Daniel brought. He was summoned one time by the abbot and given a notice to attend the Office of the Prime Minister. Daniel came and sowed it to us, wondering what it was all about. This was after his court case. All that fuss in the press seemed to have died down. I looked at the paper and the address there was not the Prime Minister’s Office at all but the Israel Security Agency, Shin Bet. Something along the lines of your CIA. I told him not to go. He sat there, said nothing, scratching behind his ear. He did that when he was thinking. In case there’s any doubt – Daniel Stein, Interpreter is about religion. As such the text sometimes takes dense, philosophical tangents. I’m not particularly religious, yet I found the book fascinating. It might be difficult for someone unfamiliar with either the Jewish or Christian faiths to understand all the nuances of the story being told. I think other readers will shy away specifically because of the religious subject matter. They shouldn’t. Because it is an interesting, well-written and – though it might seem a contradiction – accessible. A story that is also about the difference a single person can make in the world by (forgive the cliché) doing what they believe is right. In a way, Ulitskaya redeems both these religions by demonstrating in Brother Daniel what they might represent. Ludmila Ulitskaya is an award-winning (most recently France’s Simone de Beauvoir Prize in 2011) Russian author. She was nominated for the Man Booker International in 2009. She’ll be speaking at this year’s PEN World Voices Festival of International Literature in NYC. 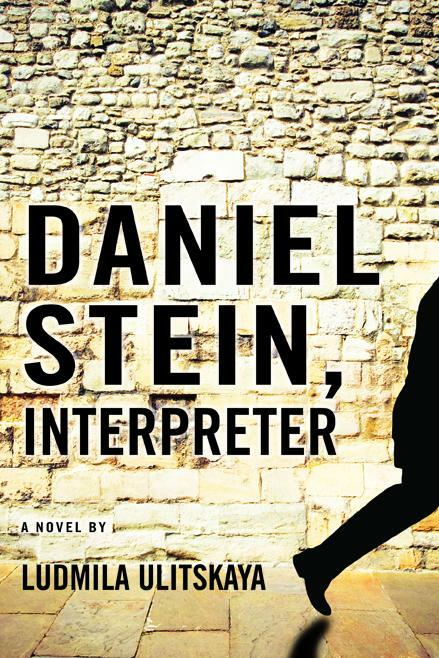 Daniel Stein, Interpreter celebrates the life of the real Brother Daniel Stein by piecing together a fictionalized history of letters, recorded interviews, diary entries and transcripts spanning a period from 1960 up to almost the present day. She numbers and dates them (i.e.-the letters, interviews, etc.) like items in an auction catalog. She even inserts her own correspondence about the writing of the novel in a post-modern twist. Ulitskaya’s prose is consistent and she establishes strong identities for each of her characters. Their voices remain interesting – though at times some of the female characters become a little homogeneous. Regardless, we get to see Brother Daniel’s life through multiple lenses. As he sees himself – in unvarnished, practical, matter-of-fact terms. And also a more complicated figure – as viewed by his friends, family, colleagues and the institutions whose lives he touched. It is a life interpreted for the reader. The plot and portrait are developed with subtlety, forming a story that has no arc other than what can be found in the life of this man. Ludmila Ulitskaya accomplishes this – without emphasizing the emotional peaks or valleys. She minimizes the drama, breaking Brother Daniel down to a series of anecdotes and burying the significant events amongst the trivialities of her characters’ daily lives. This author chose to leave a good portion of the ‘boring bits’ in the book. The overall effect, once you realize what she is doing, is startling in its breadth and accomplishment. Publisher: Overlook Duckworth, New York (2011). 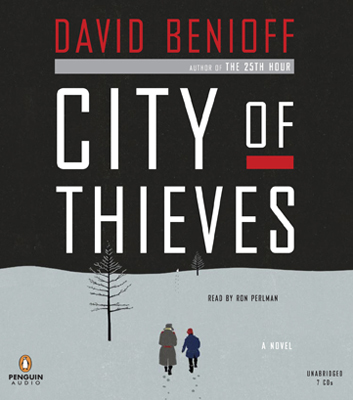 The City of Thieves audiobook, written by David Benioff and read by Ron Perlman, is AMAZING! I might be over-stating this, but I can’t remember the last time I enjoyed an audiobook as much. The plot manages to entertain despite its being somewhat predictable (everyone ends up where you expect them to). It’s the characters, combined with Ron Perlman’s narration and Benioff’s gift for dialogue, which make this book a must-listen. Of course I’m jumping too far ahead. Imagine WWII. The Russian city of Stalingrad (nicknamed “Peter” by the locals) is under siege. A young, Jewish boy named Lev Beniov is imprisoned for looting. His cellmate is a handsome, charismatic Russian soldier who has been arrested for desertion. The soldier’s name is Kolya. Both expect to be shot in the morning. Instead they are taken to the home of an important colonel in the Russian army and given an assignment. Locate a dozen eggs in the starving city for a wedding cake. Lev and Kolya have five days. Five days during which they travel through the maze of Peter: into basements, onto rooftops and finally out into the surrounding countryside. They encounter children and cannibals, German and Russian soldiers, Partisans, unlikely allies and unintentional enemies. It’s a grand, if absurd, adventure. Part-history, part-bromance novel – the high point of City of Thieves is Lev & Kolya’s friendship. The chemistry that exists between these two is magic. Their conversations are hilarious. Lev plays Burns to Kolya’s eccentric Allen (bridge the generation gap here), with Ron Perlman performing both parts with impeccable timing. The reading of this story should win awards. Perlman’s voices are dead on – each one unique, distinctive & authentic. He has a talent for putting a subtle inflection on a word or a sentence which carries a whole chapter’s worth of meaning. He brings the multitude of characters in this novel (I stopped counting at 15) vividly to life. At this point in the review I’d like to go on the record as stating that I intend to track down every audiobook narrated by Ron Perlman and listen to them all. My gold standard test of an audio book is whether or not it makes me want to extend my 60 minute commute. Did City of Thieves pass? Well, let’s just say that I may have received at least one (O.K. – maybe two) texts from my husband asking why I was sitting in the garage. City of Thieves will do more than keep your attention, it will transport you for 8-1/2 hours…and introduce you to two characters who will stay with you for even longer. Publisher: Penguin Audio, New York (2008).